On the basement level of Harold Washington College, students find space to study, catch up and a grab a bite between classes or jobs. And in the corner, something most colleges don’t have, but a surprising number might need: a food pantry. Student Government Association Treasurer Shabaka Verna knows that many of his schoolmates struggle with balancing not only time, but expenses. “With community college life, you’re not away at your dorms – you may be living with your family or renting your own apartment, and you don’t have a professional job yet. So you’re working around minimum wage … and you’re still balancing school,” Verna said. Nationwide, research shows 25 percent of community college students experience food insecurity, compared to 20 percent of students at four-year schools. And the rates of food insecurity are higher for black and Hispanic students, at 57 percent and 40 percent, respectively. The Greater Chicago Food Depository noticed the problem. In response, the group partnered with all seven City Colleges to offer pop-up pantries. 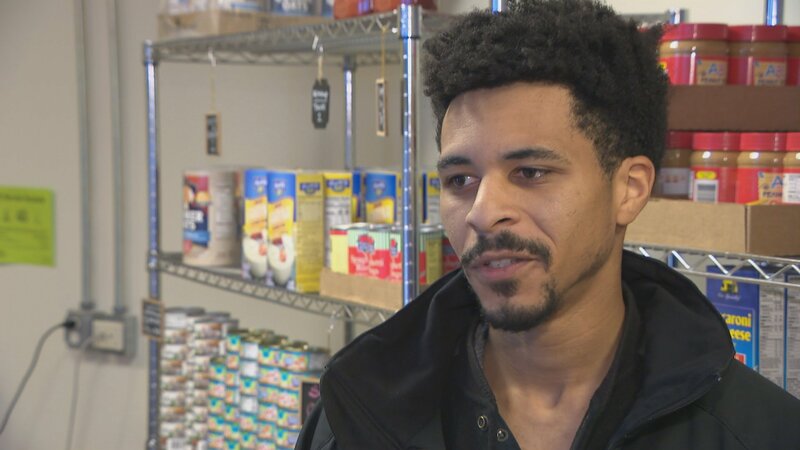 The demand was so great, the food depository opened two full-time pantries, one at Harold Washington College, and another at Richard J. Daley College on the Southwest Side. “The fact that we need food pantries inside of City Colleges is actually a sobering reflection about the need all across our community. We know that the face of hunger is changing,” Maehr said. On the afternoon we visited, a class of students came to learn about the pantry for the first time. Before leaving, several used the time to go shopping. “I got one of everything,” said first-year student Jamesha Lathan. She says it’s all needed at home. This pantry is open on Mondays and Thursday. Students have access to non-perishable food, but also fresh produce, eggs and milk. There’s no limit to how much a student can take, but they can only visit once a month. And the pantry runs on the honor system: don’t take food if you don’t need it. “Our students have so many worries,” said City Colleges Chancellor Juan Salgado. Many students here experience challenges that can lead to food insecurity, he says. “We attract many students who are first in their family to go to college, many students that come from low- and moderate-income families. We attract students that are in poverty, and extreme poverty,” Salgado said. And one bag of food here isn’t just for that student, but his or her family, too. The Food Depository says the Healthy Student Markets at City Colleges served more than 11,000 households in fiscal year 2018 and distributed more than 220,000 pounds of food – more than half of it fresh produce. The plan is to turn the pop-ups at the other five campuses into dedicated pantries like this one, as long as they’re needed. The Greater Chicago Food Depository also partners with Chicago Public Schools to provide food pantries in elementary schools as part of its Healthy Student Markets program. And it also provides food pantries at other universities, like Northeastern Illinois University and the University of Illinois at Chicago.